MOSCOW, Russia -- Tens of thousands of Russians gathered peacefully in central Moscow on Saturday to shout “Putin is a thief” and “Russia without Putin,” forcing the Kremlin to confront a level of public discontent that has not been seen here since Vladimir V. Putin first became president 12 years ago. Protesters gathered in Bolotnaya Square in central Moscow on Saturday. The crowd overflowed the square where it was held, forcing stragglers to climb trees or watch from the opposite riverbank, and organizers repeatedly cleared a footbridge out of fear it would collapse. It was the largest anti-Kremlin protest since the early 1990s. The crowd united liberals, nationalists and Communists, a group best described as the urban middle class, so digitally connected that some were broadcasting the rally live using iPads held over their heads. The police estimated the crowd at 25,000 while organizers put the figure much higher, at 40,000 or more. The rally was a significant moment in Russia’s political life, suggesting that the authorities have lost the power to control the national agenda. The event was too large to be edited out of the evening news, which does not report criticism of Mr. Putin, and was accompanied by smaller demonstrations dozens of other cities, including St. Petersburg. The government calculated that it had no choice but to allow the events unfold. There was a large police presence, including rows of troop carriers, dump trucks and bulldozers, but remarkably when the crowd dispersed four hours later, no detentions had been reported. On Saturday many in the crowd said the event was a watershed moment. Calls for protest have been mounting since parliamentary elections last Sunday, which domestic and international observers said were tainted by ballot-stuffing and fraud on behalf of Mr. Putin’s party, United Russia. But an equally crucial event, many said, was Mr. Putin’s announcement in September that he would run for the presidency in March. He is almost certain to win a six-year term, meaning he will have been Russia’s paramount leader for 18 years. Yevgeniya Albats, editor of the New Times magazine, said that the gathering was the most striking display of grassroots democracy that she had seen in Russia, and that the involvement of young people was a game-changer. “Today we just proved that civil society does exist, that the middle class does exist and that this country is not lost,” Ms. Albats said. The authorities had been trying to discourage attendance, saying that widespread protests could culminate in a disaster on the scale of the Soviet collapse, which occurred 20 years ago this month. Officials have portrayed the demonstrators as revolutionaries dedicated to a violent, Libya-style overthrow. Mr. Putin last week said that Secretary of State Hillary Rodham Clinton had set off the wave of activism by publicly criticizing the conduct of the parliamentary elections. “She set the tone for some actors in our country and gave them a signal,” Mr. Putin said. The demonstration’s organizers have put forward several demands: the immediate release of prisoners arrested last week in connection with the protests; the scheduling of new parliamentary elections; the ouster of Vladimir Y. Churov, who runs the Central Election Commission; investigation of election violations; the registration of so-called non-system opposition parties, ones that have been unable to win seats in Parliament or put forward presidential candidates. 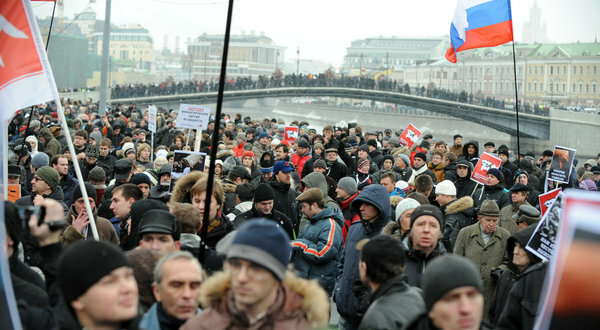 Speakers said they would give the Kremlin two weeks to satisfy the demands, and hold another large protest on Dec. 24. Aleksei Navalny, a popular blogger who has helped mobilize young Russians over the last year, sent an address from the prison where he is serving a 15-day sentence for resisting the police. Mr. Navalny was arrested Monday night after the first of three demonstrations. “Everyone has the single most powerful weapon that we need — dignity, the feeling of self-respect,” read the address, which was delivered by a veteran opposition leader, Boris Y. Nemtsov. The blogosphere has played a central role in mobilizing young Russians this fall. During the parliamentary campaign, Russians using smartphones filmed authority figures cajoling, bribing or offering money to their subordinates to get out the vote for United Russia. More video went online after Election Day, when many Russians in their 20s camped out in polling stations as amateur observers. “The Putin system, over many years, repeats the same mistakes and ignores public opinion,” said Leonid Gigen, 26. The ruling party, United Russia, lost ground in last Sunday’s election, securing 238 seats in the next Duma, compared with the 315, or 70 percent, that it holds now. The Communist Party won 92 seats; Just Russia won 64 seats; and the nationalist Liberal Democratic Party won 56 seats. The vote had come to be seen as a referendum not only on United Russia but also on Mr. Putin and his plans to stay on as Russia’s paramount leader. Mr. Putin remains by far the country’s most popular political figure — the independent Levada Center reports his approval ratings at above 60 percent — but that approval has been diminishing gradually despite the authorities’ efforts to shore it up. It seems unlikely that the authorities will accede to the protesters’ demands. A deputy chairman of Russia’s Central Election Commission told the Interfax news service that the final report on the election results was signed Friday, and that he saw no reason to annul them. “The elections are declared valid, and there is no reason for any other assessment,” the official, Stanisav Vavilov, said. “Do not allow yourself to become a pawn in the hands of those who want to destroy our country,” he said.